I’m confused. It was terribly hot a couple of weeks ago, then it rained like mad and the leaves began to change. Now it is hot and humid and raining. Summer is not going to depart easily. You’ll need cool refreshment. Here’s an idea from three years ago that just fits the spot. And uses up the last of summer’s cucumbers. How do you consume cucumbers? And how many? The numbers can be surprising for Suzen and I both eat and drink them year round. Lot of them. I think, but I’m not sure, that drinking is the bigger portion. My newest love, an intense cucumber agua fresca, is featured here. And tomorrow, if you prefer to eat your cucumbers — or sip them — then look for a grand Green Gazpacho. 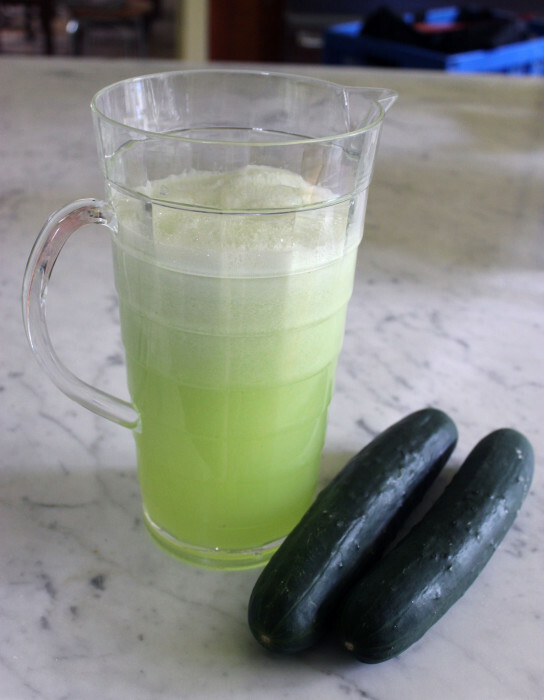 I was searching for cucumber agua fresca recipes and encountered this one from Epicurious. It’s different from others because it contains a lot of sugar and a lot of lime juice, too. You can adjust the sugar content if you want to make it a tad less sweet. I’ve done that and also substituted lemon for lime juice — the result in that case was less tangy and just pure cucumber flavor. Is one version better than the other? I vacillate and I’m making them both. A tall, cold glass of cucumber agua fresca has become as necessary as my garden gloves and trowel when I’m gardening away. Oh, yes, I’m planting cucumbers. If your blender is large enough, place all the ingredients in the container and process until beyond slushy but not smooth. You want the ice to remain somewhat fragmented. If you need to, process in two or three batches that’s fine. Serve in tall glasses filled with additional ice cubes.